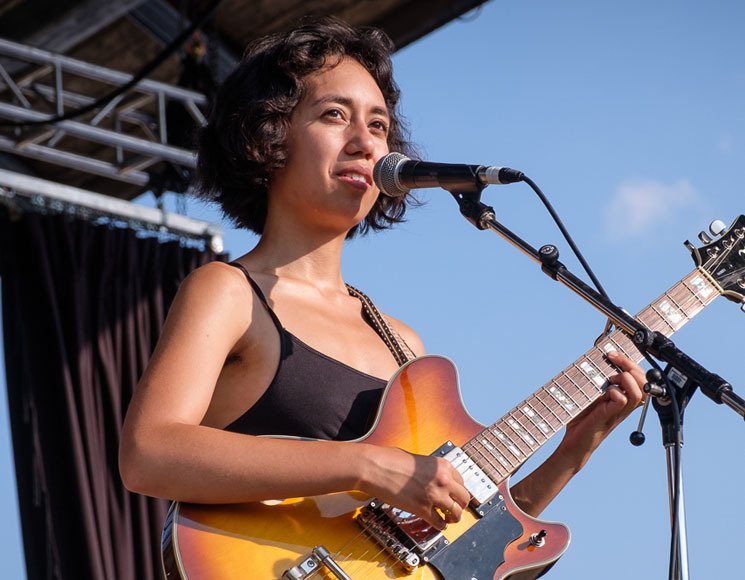 Portland, OR-based singer-songwriter Haley Heynderickx has a fairly understated stage presence, but her big sound more than filled the space of the massive Main Stage. Crafting emotive folk rock, Heynderickx's vivid, nature-filled lyrical imagery and laidback demeanour fit the Hillside vibe perfectly. Joined by a drummer and keyboardist, Heynderickx's tunes possess a self-assured quality. The ethereal harmonies of "Fish Eyes" gave way to crashing drums, showcasing the power in its minimal elements. A solo cover of Jackson C. Frank's "Blues Run the Game" demonstrated Heynderickx's effortless vocal range. Set closer "Worth It" featured a lengthy, meandering song structure but retained focus throughout with Heynderickx's noodling guitar lines, Feist-esque harmonizing and methodic build. The warm tunes from Heynderickx's debut album I Need to Start a Garden showcase a strong, idiosyncratic songwriter on the verge of a breakthrough, and her Hillside set proved that she's just as capable as delivering those powerful moments live.